Guideline for Oral and Poster Presentations will be apeared. The international Workshop on Fast Ignition of Fusion Targets has become the principal specialist meeting on fast ignition. It was last held in Florida in November 2002 following the 44th APS, Annual Meeting of the Division of Plasma Physics. The 7th meeting will be held at the Kyoto Tokyu Hotel, Kyoto, JAPAN, April 25-29, 2004. In order to bring in more activities especially from Asia to the workshop related to the ultra-intense laser plasma interactions, the scope is widened to the high field physics too. There will be sessions from Monday to Thursday. The session will be the oral in the mornings, the poster in the afternoons, and the oral in the evenings in the style of the Gordon conferences. There will be a banquet on Wednesday evening. The meeting will follow the 2002 style by having a continuous poster display of all the talks to encourage good discussions. Attendees should be specialists or new young researchers in these fields. There will be approximately 70 attendees. Space is limited and early registration is recommended. The business of the Workshop will be handled through this Web site, which you are reading right now. We will provide full information for registration and submission of paper. We are looking forward to seeing you in Kyoto. 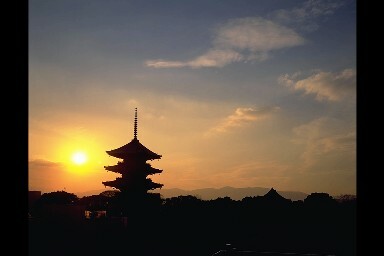 Kyoto is the ancient capital city of Japan. We hope all of us have a scientifically enjoyable meeting in Kyoto!